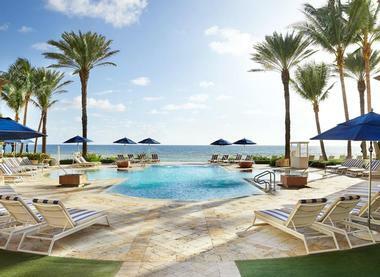 Eau Palm Beach Resort & Spa is a private, intimate, beachside resort located in Manalapan, Florida. Guests from all over flock to Eau Palm Beach Resort & Spa to experience its luxurious, award-winning location, complete with ocean views, warm breeze, soft sand and breathtaking sunsets. The professional staff at the Eau Palm Beach Resort & Spa is always there to help their guests achieve ultimate relaxation and enjoyment for the entire duration of their stay. Guest Rooms – Each guest room comes complete with the comforting sounds of the ocean’s waves and views. Guests can enjoy the water from their private balcony, then sink into the high-quality, premium bedding for a good night’s sleep. Bold, bright colors are found throughout the room, with interesting pops of pattern found in the carpeting and decorative pillows. Suites – For a more spacious retreat, guests can also choose to stay in one of the Eau Palm Beach Resort’s suites. The suites are perfect for larger families or groups because of its large living area, ideal for socializing or entertaining. The suites are also known for their views of the luxury pool or ocean-side vista. The bedroom, two bathrooms and common area are all separated, creating a more private, comfortable layout. The suites accommodate four people comfortably. Additional amenities included to guests lodging in the Resort’s suites include housekeeping twice daily, as well as complimentary wireless Internet. Lanai Terrace Suites – These suites are truly unique for its ground level location and private garden. Guests that stay in the Lanai Terrace Suites are also the closest to the two Eau Palm Beach Resort pools. Similar to the standard suites, the Lanai Terrace Suites have separate bathrooms, bedroom and living room and can accommodate four people comfortably. The Terrace Suites offers its guests the perfect balance between indoor and outdoor lodging. Angle – This restaurant is recognized for its regionally grown ingredients that make up many of the restaurant’s specialty dishes. Angle’s food is Modern American, with an emphasis on local produce, prime meats and Florida-caught seafood. Angle is known for their “farm-to-fork” cuisine. The atmosphere is elegant and formal, with candlelight, dark, velvet walls and mirrors placed intentionally throughout the restaurant. Some of their most beloved dinner entrées include Lake Meadow Farm Chicken Roulade, Dayboat Sea Scallops and Florida Red Snapper. Temple Orange – Open for locals and guests alike, the Temple Orange has longtime been a culinary favorite at Eau Palm Beach. The food has a Mediterranean-style taste, however choice beef cuts and local produce can also be found on the menu. The Temple Orange is famous for its signature brunches and buffets, and is open daily for breakfast, lunch and dinner for its guests’ convenience. 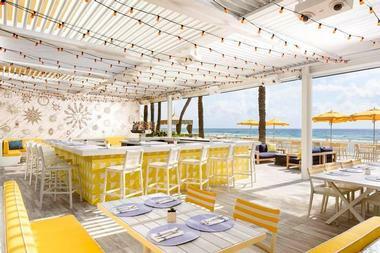 Breeze Ocean Kitchen – Just as the name implies, guests and locals can enjoy the warm ocean breeze as they wait for their Floridian cuisine, oftentimes prepared with the styles, spices and flavors of the exotic Caribbean, Latin America and parts of Asia. The inventive chef creative dishes that are representative of the relaxing, beach side venue of the restaurant. Land and sea platters provide variety as diners choose amongst restaurant favorites including Seafood “Cioppino,” Creekstone Farm Braised Short Rib or Florida Red Snapper. For those who want to extend their dining experience for a sweet treat, popular dessert options include Almond Teff Cake, Dark Chocolate “Candy Bar” and Warm Bread Pudding. Stir Bar & Terrace – At the Stir Bar & Terrace, guests can end the day with a mixology-inspired specialty cocktail. They can also choose to pair their cocktail with a snack or one of the light foods offered at the Bar & Terrace. At dusk, the lights of the Bar begin to dim and diners can extend their party outside to continue sipping and socializing all while staring off at the sun setting behind the great Atlantic or into the blazing fire pit. 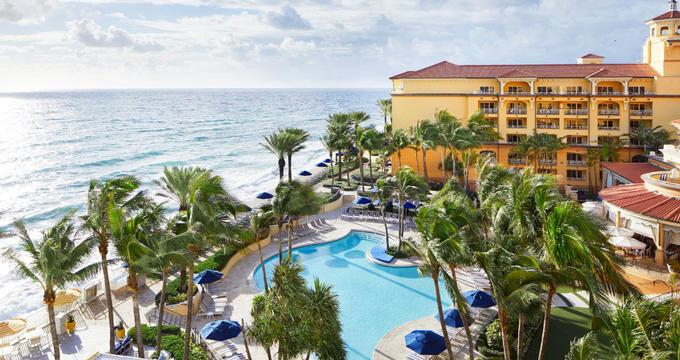 For the ultimate luxury experience, guests can explore the 42,000sf gem of the Eau Palm Beach Resort. Named the “adult playground,” guests will be encouraged to slip into their plush slippers and allow the professional salon and spa “fairy” staff to pamper them without limit. The Eau spa is divided into three sensory inspired steps: to pause, to play and to perfect. The first thought at the Eau Spa, to pause, is customized with only the guest’s pampering in mind. This step encourages all guests to seek relaxation. Scents experienced in to pause are mint and lavender and the therapy color is blue. Chill, slow-paced music is played during to pause. The second taste at Eau Palm Beach Spa is to play. Scents include eucalyptus, with a color therapy of red and an upbeat, faster-paced, European lounge style of music played in the background. The third and final touch at Eau Spa is to perfect. Guests are immersed in an atmosphere infused with vanilla and ginger. The color for to perfect is gold and is accompanied with a scintillating variation of musical tunes. Guests can also indulge themselves with a glass of champagne and signature, spa cupcakes. Eau Palm Beach Resort has much to offer couples in search of the perfect wedding venue. The sun-kissed location, light, sandy beaches and an Atlantic Ocean backdrop are all included for interested couples. The Resort also includes a 30,000sf space for couples to work with while planning for their perfect day. This event space is both indoors and outdoors, allowing couples to work around the weather. There are also an abundant number of locations for photo opts, including a Grand Ballroom and Oceanside, private cabanas, perfect for creating memories that can last a lifetime. The grand, Commander-in-Chief Suite is available for guests to end their wedding day, offering a two-bedroom, 2,600sf suite with mesmerizing ocean views and high-end accommodations and amenities. Guests can also take advantage of the Resort’s professional wedding planners and specialists. Tours are available for couples interested in selecting the Eau Palm Beach Resort for their magical wedding venue.